Until a recent Saturday morning, 6 year old Laura Drake had never heard of trillium. But that day, as a participant in the Junior Naturalist Program, she observed the gleaming white 3-petaled blossoms. She learned that trillium blooms will turn from white to pink to maroon when they age, as illustrated on the reader board display at the entrance to the Native Garden. She also learned that trillium plants need the blooms to feed nutrients back into the plant for the following years growth, and that picking the blossoms of trillium plants severely threatens their survival. A few days later Laura returned to the Native Garden with a sign she had made, so that anyone tempted to pick the blossoms would understand why it is so important to enjoy the flowers without picking them. 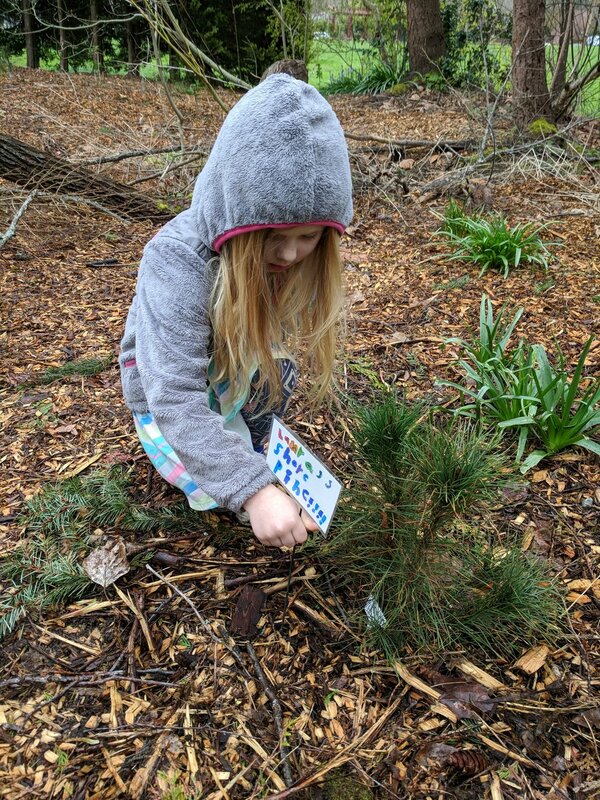 The Junior Naturalist Program was initiated by Concerned Citizens for Mercer Island Parks to share observations and knowledge about native plants, birds, butterflies, insects, amphibians, and other wildlife with children aged 6 to 10, accompanied by a parent or grandparent. Participants are learning to identify native plants, listen for and learn about native birds, record their observations, care for our Native Garden, share their knowledge with others, and be leaders in their family and community. Laura will be leading a “Native Garden Tour for Children and Their Families” during the Native Plant Sale in Mercerdale Park at 12:30 PM on Saturday, April 28. This special tour is limited to 6 families. To register for Laura’s tour and to sign up for future Junior Naturalist events, visit protectMIparks.org. For questions email protectMIparks@gmail.com. Junior Naturalist Program instructors include Rita Moore, Native Plant Steward, Washington Native Plant Society and National Wildlife Federation Habitat Steward, and Linda Anchondo, Seattle Audubon Society Master Birder. At the end of one recent Junior Naturalist program, Linda pointed out a male Anna’s Hummingbird to participants that was perched in a treetop. The hummingbird trilled, and a female Anna’s Hummingbird responded from a nearby shrub. The male zoomed directly to her, and they engaged in courtship bonding. Wonders abound in the Native Garden, a National Wildlife Society Certified Wildlife Habitat. By visiting frequently, observing closely, and being careful not to pick or damage ANY plants, Islanders will be able to enjoy our Native Garden in every season of the year.